Title: Westbound 4571 passes by Toluca, Ill. Description: BNSF GE's lead Q326-26 into Trowbridge siding, to wait for D709. 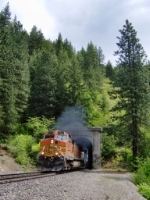 Title: BNSF C44-9Ws 4571 and 606 draw pusher duty on an eastbound stack train. Title: BNSF 4571 and 606 push their train east past the pond. Description: The Northtown to Noyes train has always been a good one to catch power along for a ride. They usualy set out power in Dilworth and Grand Forks. Today the entire train went into the yard at Dilworth waiting for a crew. Description: BNSF 4571 and 7591 with 7591 being the lead unit of a Westbound Train. Description: BNSF 4571 with yet another HD shot.